Oktoberfest is starting soon and it is the perfect time to try new beers and really enjoy the huge amount of beers available. As a cocktail obsessive I love that beer can also be used in a cocktail. I know it sounds weird but it’s true! I decided to recreate a rum (my favourite spirit for a cocktail – did someone say daiquiri?) and Guinness cocktail for Oktoberfest called The Diving Header. It is sweet and the spices from the rum really come out but without messing around with the rich Guinness taste. (if you already thinking ahead to Christmas it would make a great combo for homemade Christmas puddings to soak the fruit in). 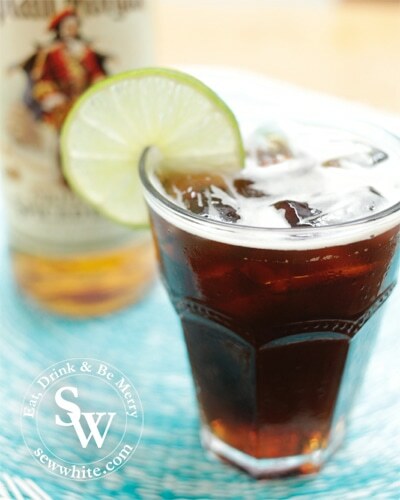 Pour Captain Morgan Original Spiced Gold, cola and GUINNESS® into the glass. Using a jigger, measure 25ml Captain Morgan Original Spiced Gold, 150ml cola and 50ml GUINNESS® into the Tankard. It is a lot lighter than a Guinness on it’s own and perfect if you like the taste of Guinness but would prefer it a little lighter. It’s a nice trio of tastes which can easily be adjusted to the taste you want. I really liked it with a little extra rum and less Guinness. I also added a little vanilla and a squeeze of lime to mine – worked a treat! I loved the mix and tones of the colours in the drink. I will definitely be drinking this a lot during Oktoberfest. Some might say it’s more girly but I think its more tasty! A beautiful mix of flavours with a nice sweetness and spice. Disclaimer this is a sponsored post. All images and opinions are my own. I keep hearing about beer cocktails but yet to try one. I love cocktails and I love beer but together I’m rather unsure!!! It is unusual but it really works. Be brave! Really like the sound of this as I’m such a cola fan! Great to cool down with right now too. Love the sound of your cocktail, great flavour combinations and perfect for Oktoberfest! I feel I may drink a lot of these for Oktoberfest!